Of course the other side to Skitch is that you can instantly upload and share images to Skitch.com directly through the app, which makes sharing pictures extremely easy. In case you were wondering, Skitch used to be $9.99 but is now free because it was bought out by Evernote, which is a great note taking and syncing utility. Not a big fan of the quirky interface but Skitch is a good app outside of that. I do wonder if we will see it merge with Evernote. 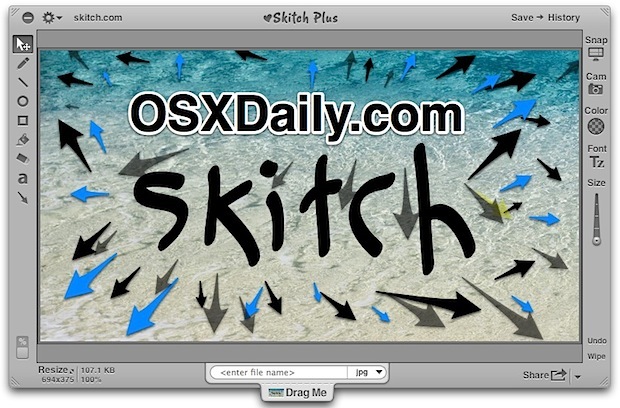 Skitch has the worst GUI I’ve ever seen on a Mac app. What a disaster.